“I believe in Gotham City.” “I believe in Harvey Dent.” “I believe in Jim Gordon.” “I believe in Batman.” At various moments (sometimes more than once), these declarations are declared with fervor. Belief and faith in comrades, family, and friends permeates “Batman: The Long Halloween”, testing the characters’ loyalties and trust. The book is a crime noir that contains the outsized emotions and action that is required of the genre, bearing the inimitable style of frequent collaborators Jeph Loeb and Tim Sale. Writer Loeb and artist Sale (along with colorist Gregory Wright) craft a tale that is immense and operatic, with twists and turns (and the occasional quiet and, at times, intense psychologically profound moments peppered throughout) that keep the reader guessing and second-guessing through the turnstiles of the story. Crime bosses, Arkham Asylum residents, and the triumvirate of Batman, Captain (not yet Commissioner) James Gordon, and District Attorney Harvey Dent (and they’re respective loved ones) collide in an epic that has repercussions for each one of these characters. Story, art, and color are all molded together into one of the greatest Batman (and just plain old comic book) stories every told. Carmine “The Roman” Falcone and Vincent “The Boss” Maroni are two Italian crime families that work out of Gotham City. One Halloween night, Falcone’s nephew is murdered in his bathtub, which leads Batman, Gordon, and Dent on a mission to find out who killed him. After the first murder, subsequent murders related to the crime families occur on a different holiday, leading the killer to be dubbed “Holiday” or “the holiday killer.” Intrigue and mystery abound, with loyalties tested and betrayed throughout the book’s proceedings. In the midst of the families’ search for the identity of Holiday, Batman’s rogues (and Catwoman) appear throughout the series’ thirteen issues. Every story beat and every character are integral to the story, with Loeb not just tossing villains in the mix just for the fun of it. Everything and everyone has their place in the tapestry of the narrative, with the winding nature of the story leading to a conclusion that the reader won’t easily see. The story has been woven in such a way that anyone and everyone can possibly have a role in the machinations of the plot. “Batman: The Long Halloween” has the style and mood of a film-noir. Loeb added a great “noirish” touch to the book by having the detective, Bruce Wayne, narrate the story and having the reader get into his head. Loeb has done this in other books and he has a gift for dwelling and expressing what lies within a character’s mind. The setting is urban, with a dark and bleak mood that permeates the story. Yet, despite the darkness, rare touches of humor are thrown in to lighten the mood, such as the scenes where Alfred gives Gordon and Dent the runaround when they go searching for Bruce at Wayne Manor. Noir is sometimes described as melodramatic in nature, and this graphic novel has melodrama (and not in a derogatory way) in spades. Exaggeration is evident with the large (and expertly set up) cinematic panels that dominate the goings-on. Grandiloquent battles between Batman and his foes, along with the quiet moments between characters, are filled with emotion and, at times, pathos. There are even femme fatales thrown in the mix (and not just the obvious ones like Catwoman and Poison Ivy). Although noir elements are prevalent throughout, they don’t strictly define a saga that is layered and meant to be read more than once to appreciate its richness of story, mystery, character, and art. Connection is a theme that lies at the heart of Loeb and Sale’s story and not just the obvious one of blood ties. 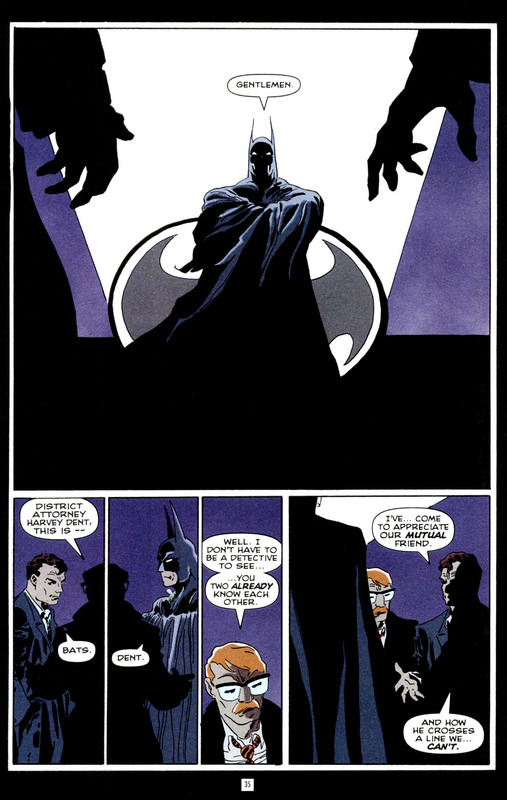 In the first issue, the relationship between Batman, Gordon, and Dent is set up in a brilliant scene atop police headquarters with the Bat-Signal summoning the Dark Knight to a meeting of titans. 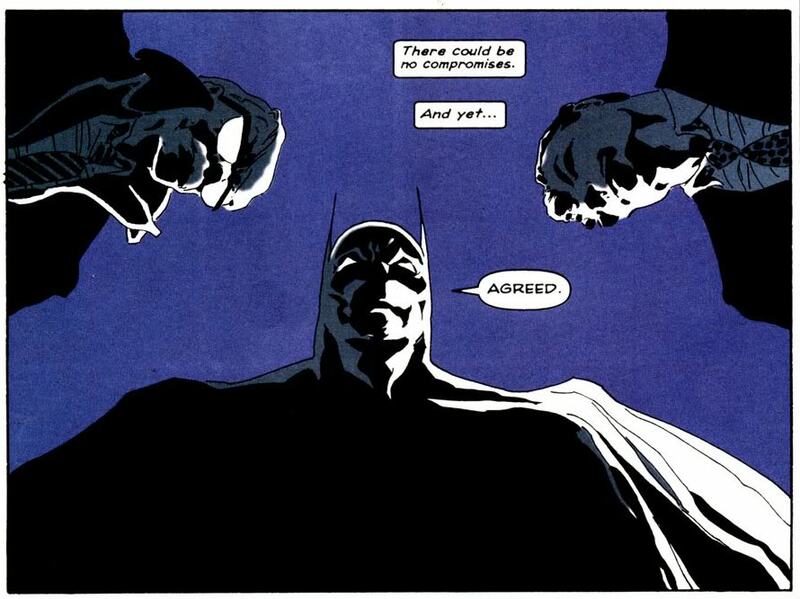 When Batman appears, the bluish grey, black, and white of Wright’s colors highlight Sale’s depiction of an imposing Batman as he stands with authority (and arms crossed) in the shadows before the two lawmen. Gordon insists, in their mission against the crime families, that they may bend the rules, but must never break them. Dent agrees and then gives Batman a slightly suspicious sideways glance. In the bottom panel of the page, Batman says, “Agreed” and the unconventional triumvirate of allies has forged a pact meant to topple the enemies of their corrupted city. In that same panel, the point of view is of the reader looking up at the three faces, with Batman being in the middle. Although he is relatively new to his job as Batman in the book, he has the bearing of someone who embodies the strength, will, and courage to bring the scourge of evil to justice. The reader will believe in these characters just as the believe in each other. Bruce can’t let go of the Bat. The tête-à-têtes between Batman and Catwoman (as well as in their non-costumed identities of Bruce Wayne and Selina Kyle) contain a tension laced with a hint of trust that is slowly building between them. Their connection is one that is laced with innuendo, hesitation, and secrets that are yet to be revealed between them. Before battling two of Batman’s villains who have teamed up under nefarious circumstances, Bruce and Selina are at Wayne Manor enjoying an evening together (with neither one of them knowing the alias of the other). 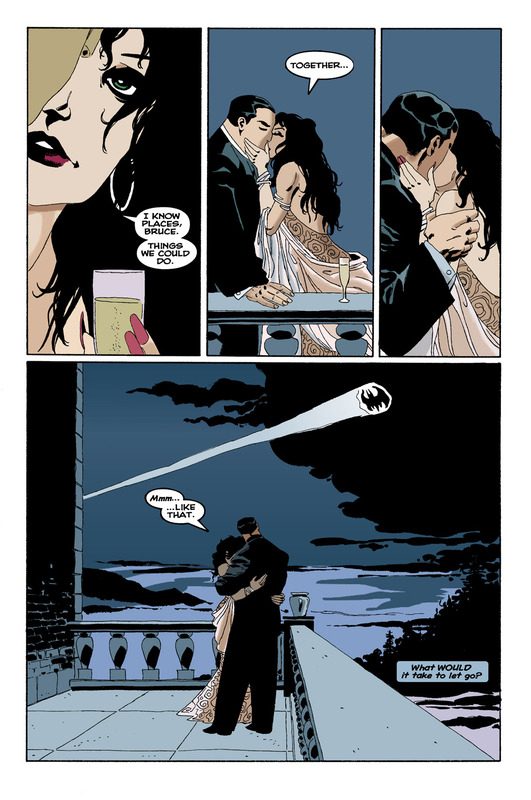 Selina offers Bruce the opportunity to escape a city that he feels chained to since the deaths of his parents. They embrace on the balcony, with Selina looking toward the reader and Bruce looking at the Bat-Signal shining in the night sky. Bruce thinks to himself, “What would it take to let go?” In this first-rate scene, Loeb and Sale answer that question: nothing. Even with a prospect of a “normal” life right before him, Bruce has an unending quest to defeat the scourge of evil that caused the murder of his parents. Like any conflicted hero of noir fiction, Bruce struggles with the straddling between the light and the dark. Soon after this scene between Bruce and Selina, after they take down two of Batman’s villains, Catwoman suggests to Batman that they escape this life and start anew. Once again, Sale’s art expresses deep emotion in his characters’ expressions. Batman looks away, with his mouth visibly creased downward, suggesting stoicism and possibly even sadness at his refusal to leave the costumed crimefighting lifestyle. Loeb’s words, naturally, add even more dimension to the scene when Catwoman says, “Your loss” and Batman responds with, “No. The price of independence” (which is apropos for the issue, which is titled “Independence Day”). Scarecrow and Mad Hatter are muttering the words “fears” and “madness” as he says this, reflecting the two concepts that haunt and taunt Bruce Wayne’s psyche. Tragedy permeates this book, what with the numerous deaths associated with the killer Holiday and the “death” of relationships and ties that bind families. The word “family” is not only related to the crime families (although it is the main building block of the plot), but also to families long gone. Bruce Wayne is affected by the Scarecrow’s fear toxin in the “Mother’s Day” issue, racing away in horror from the killer of his parents. The toxin causes Bruce to think the police that are chasing after him are really the thief who murdered his parents. One particular panel has Bruce running down Crime Alley, his shadow plastered to the brick wall as he’s sprinting away from Gordon and the police. He is racked with guilt, thinking to himself that if he only hadn’t pressured his mother to wear her pearls, then maybe his parents would still be alive today. Loeb’s use of Bruce’s inner monologue here and throughout the book displays the talents of a master storyteller who can convey so much in so few words. In the final haunting scene before the police catch up to him, Bruce is embracing his mother’s grave with his mouth open in anguish, tears streaming from his closed eyes. This scene, among so many contained within this graphic novel’s pages, exhibits the skill of Sale and Wright in conveying mood and emotion. The brightness of Martha Wayne’s grave and the moon peaking behind dark clouds is in stark contrast to the gloomy colors and shadow contained within this panel. An added touch of genius to the art is the depiction of the top half of Bruce covered in the moon’s brilliant glow, while the bottom half of his body is dark and cape-like. Small touches like these show the thought and detail put into the art, as well as the writing. Melding of word and picture, once again, births greatness. “Batman: The Long Halloween” revels in its big-screen noirish style, mood, and plot. The epic nature of the story meshes with a tale that is actually very personal and is a tragedy at its core. Jeph Loeb and Tim Sale focus on character, making sure that a large, melodramatic tale can be told with a humanity and pathos that make it more than just your average hardboiled detective yarn. Bombast is nowhere to be found within these pages; only understated character studies, intrigue, and, of course, an entertaining time. Cinematic in nature, this story could only have been told through the art form of the comic book. The cinema styling is evident in Sale’s depiction of battles between Batman and his costumed rogues (who show up in abundance) and the coloring choices of Gregory Wright (whose coloring is understated when it needs to be and bright at just the right moments). Loeb, Sale, and Wright should be proud that they have molded a masterpiece that belongs alongside other dazzling Bat-classics. I’ve heard so many good things about The Long Halloween. Now I feel like purchasing it for sure. Thanks for the review mate! You’re very welcome! Feel free to tell me what you thought of the book after reading it!